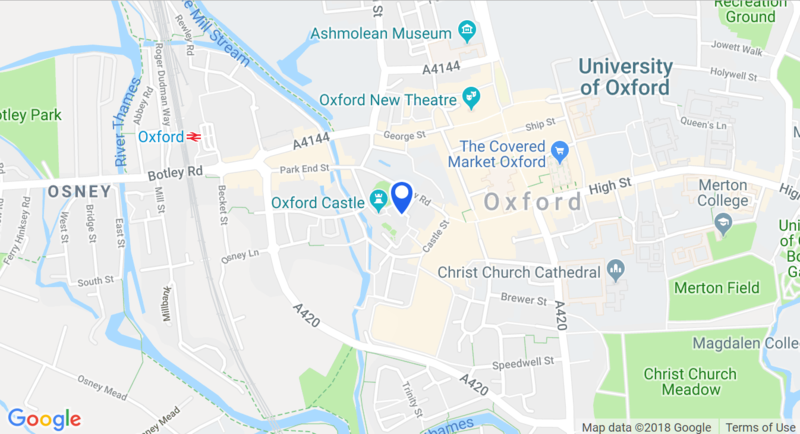 The Heritage at the Heart of the University City of Oxford is Oxford Castle Quarter. Its history spans ten centuries, beginning even before the Norman Baron Robert D’Oiley built St George’s Tower and the Mound in 1071. The site has served time as a Royal Castle, from which the City and upper reaches of the Thames Valley were administered, as a centre of justice, and for several hundred years – a Gaol – hidden from the public view behind impenetrable 5 metre high stone walls. This remarkable place has now become Oxford’s Oldest New Quarter. The historic buildings have been restored and appropriate architectural additions have been made. A truly urban environment has emerged, with new and easy public access on all sides to reveal a host of exciting surprises. Apart from the abiding Heritage of the site, it offers many other facilities. Accommodation is provided in 40 unique apartments and, for the shorter term guests, Malmaison Hotel is crafted within the prison walls – a charismatic place to stay with the famed Malmaison-style interpreted in unique buildings. Beside the restaurant and bars in the hotel, other new places to wine and dine have been opened – each with seating both inside and in the open air. The visitor attraction, Oxford Castle – Unlocked, brings the site’s history to life, opening a whole new perspective on Oxford. Visitors can climb the Norman Castle Mound and enjoy panoramic views from the top of St. George’s Tower, while centuries of prison life are revealed within the 18th century buildings, taking the story across 1000 years, right up to living memory. The very heart of the City offers the best in hotel hospitality, unique shopping, great restaurants and bars, visitor interpretation, visual and performing arts and 1000 years of Heritage. A visit to Oxford Castle Quarter is not to be missed or ever forgotten! Trevor Osborne joined forces with the County Council and the Oxford Preservation Trust to add a new layer to the site’s 1000 years of history. By acquiring a 200 year lease from the County Council and gaining planning permission to develop the Oxford Castle Heritage Project, Trevor Osborne secured a sustainable future for these important buildings and monuments. May 2006 - Oxford Castle Quarter is officially opened by Her Majesty the Queen. The site was then acquired by the County Council and gained popularity with film makers. Inspector Morse, Bad Girls and The Bill have all been filmed there and it reached the big screen when featured in 102 Dalmations, The Spy Game and Lucky Break. Spy Game: 2001,Starring Robert Redford and Brad Pitt. Plot Set in 1991, the film depicts the U.S. and Chinese Governments on the verge of a major trade agreement with the American President due to pay a visit to China to seal the deal. When the Central Intelligence Agency gets word that operative Tom Bishop has been captured trying to free an Englishwoman, Elizabeth Hadley, from a Chinese prison near Su Chou, and is being questioned under torture and will be executed within twenty-four hours unless he is claimed by the U.S.
Oxford Prison was used as the Chinese prison set in Su Chou. Shots of the ambulance approaching the prison were also filmed in Queen's Lane in Oxford. Lucky Break: 2001, Starring James Nesbitt and Timothy Spall. Synopsis: Feel good prison-escape movie that sees a group of prison inmates, put on a theatrical show of Nelson: The Musical to cover their daring break-out attempt. 102 Dalmations: 2000, Starring Glenn Close, Gérard Depardieu and Ioan Gruffudd. Synopsis: After a spot of therapy Cruella De Vil is released from prison a changed woman. Devoted to dogs and good causes, she is delighted that Chloe, her parole officer, has a dalmatian family and connections with a dog charity. But the sound of Big Ben can reverse the treatment so it is only a matter of time before Ms De Vil is back to her incredibly ghastly ways, using her new-found connections with Chloe and friends. Bad Girls: 1999. TV Series shot on location at Oxford Prison. A thoroughly thought-provoking drama series based on the events in a womens prison. Bad Girls captures the highs and lows in the prison, and questions which side of the bar really is the most intense- its a world where the 'screws' versus the 'cons,' a world where anything and everything can happen, a world where the women really are vulnerable at the hands of the screws. The Prison Closes for the last time. In 1878 the Prison Commissioners took over the site and Her Majesty’s Prison Oxford was established. The prison, sometimes housing three men to a cell. The site then became home to a new County Hall and remodelled County Gaol and Court. Within the walls, designed to keep prisoners in and the public out, were the Debtors’ Tower, the Governor’s House and Office, A, B, C and D Wings, Punishment Cells and an Exercise Yard. In the 1770’s a Prison report by John Howard condemned the buildings, stating that years of neglect had made them unfit for human habitation. The site was reacquired by the Government and a major redevelopment programme ensued. The new and austere buildings, some of which were designed by Prison architect William Blackburn, formed the basis of the Gaol’s lugubrious appearance today. The Castle was refortified and garrisoned during the English Civil War but was eventually destroyed by Parliamentary troops, keen to remove symbols of Royalist loyalties. It remained the site of the Gaol however and the prison buildings were repaired and extended. During the reign of King James, the Castle was purchased by Christ Church College. The Castle is officially recorded as being a prison, although, it is believed that it was used in part as a prison long before then. Legend has it that in 1142 Princess Matilda, Henry I’s only legitimate child and known as the Empress Maud, escaped from Oxford Castle by fleeing across the frozen Thames, camouflaged against the snow and ice by her white nightdress. She was running from her cousin Stephen who had seized the throne on Henry’s death in 1135 and had now besieged the Castle. The development of Oxford Castle began in 1071 when, having fought alongside him during the Norman Conquest of 1066, Robert d’Oilly built Oxford Castle for William the Conqueror. The Castle was strategically positioned near to the river, on the western edge of the existing Saxon town defences. The Motte, or Mound, with a well chamber, stands over 20 metres high and is now a Scheduled Ancient Monument. The secrets of Oxford Castle have been Unlocked revealing episodes of violence, executions, great escapes, betrayal and even romance. Walk through these ancient buildings and experience the stories that connect the real people to these events. Tickets: Call 01865 260 666 for the latest ticket prices.